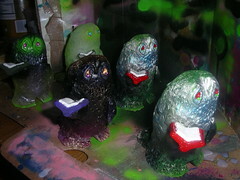 These will be the first standard releases for the Reading Monster figure. Left to right: Green Fade (test), GID, Purple Fade (giveaway), and two Silver/Black Fades. The Silver Black Fades will be available for sale along with the Bloody Valentines Edition. The Purple Fade is Black to clear purple with Gold accents and will be a giveaway for the official drop.